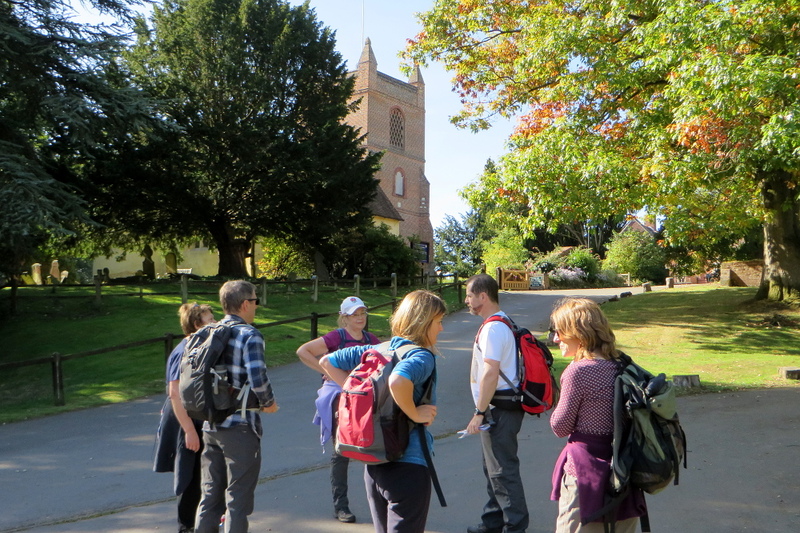 This walk had previously been planned to take in Knowle Hill and would have been about nine miles, but we chose to shorten it in view of the predicted temperatures of 30°C. West End Farm earlier in the year, when we pre-walked the route. I was pleasantly surprised that all together there were ten ramblers up for the walk today. We assembled in the centre of Waltham St Lawrence, parking in the main area by the church as well as on roads leading from the centre. We left the village heading west initially walking on the road past church farm, leaving the road onto a footpath (which thankfully was quite shady) on the left heading toward Gunnersbrook. Reaching the B3024 we headed right and took the footpath on the left through West End Farm. 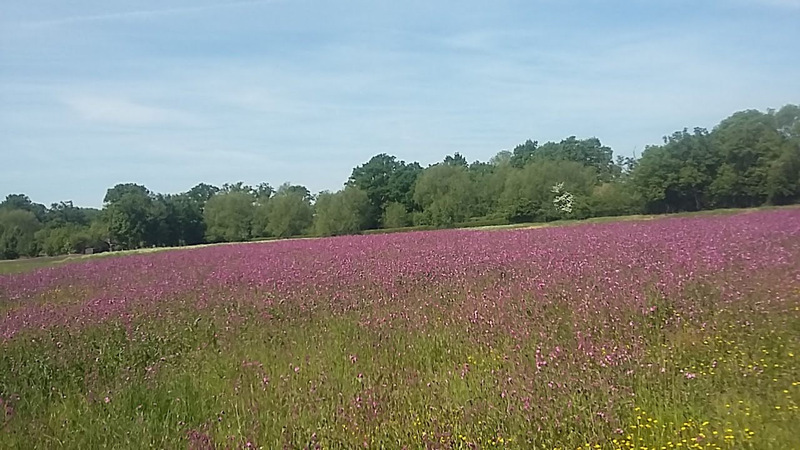 When this was pre walked the fields were purple, see photo. 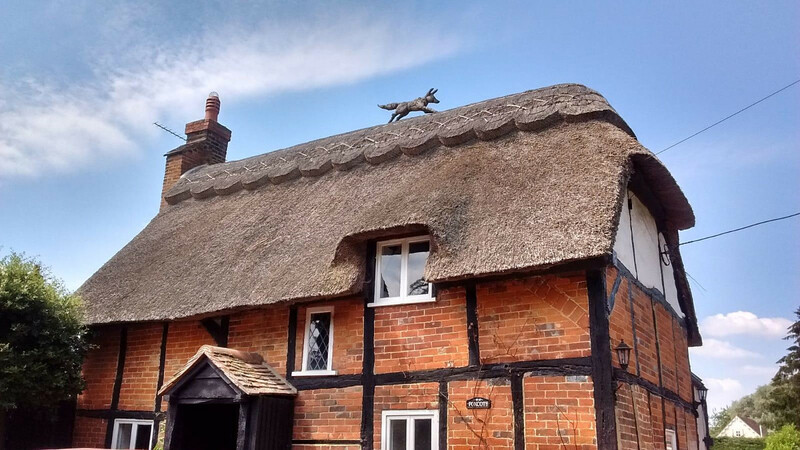 Some artistic thatchwork atop Foxcote Cottage. We turned onto Bailey's road, then followed a footpath to a T-junction where we took the left path over the field, which in the heat, was very exposed. Heading straight into another field we continued until we reached the Hungerford Road, where we joined a footpath that was fairly shaded. Turning left on the B3018 we continued until we came across a footpath on the left. This took un on a shady path, past an interesting building that looked like an old school. There were also many rhododendron bushes along this path, and would be good for a walk earlier in the year e.g. May/June. Stopping for lunch by the lake in Shottesbrooke Park. At the crossroads, again on the Hungerford Road, we turned right, taking a footpath with Whitfield’s farm on the right of the path. We crossed two fields with several horses who were very curious but quite friendly. Following the footpath until we reached the road, we turned right onto the Knowle Hill Bridleway. Following a footpath that led us into Shottesbrooke Park, we stopped by the lake and had lunch. 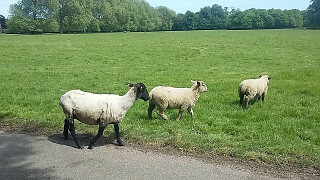 When pre-walking this in May, there were sheep roaming freely in the park. We caught sight of them, but they were much further away in another park of the park. This is where the walk changed. In shortening it, we took the path on the left of the church, taking us through a very curious and interesting brick arch/tunnel. We followed the footpath with Burringham woods on the left, then taking a narrow path to the left (mainly to avoid the sun) bringing you out on the same road which leads back into Waltham St Lawrence where the walk started. A few walkers went straight home but the majority of us had a drink in The Bell Inn. Thank you to Ann and Kathy for leading this walk, for writing it up and providing the photos. There were seven on the walk including Julie & Chris from Herts Ramblers who have joined us before. This was our first walk in the rain this summer! Whilst some might be put off (a change from the heat) it was a chance not to be missed by Chris to try out his new waterproof! 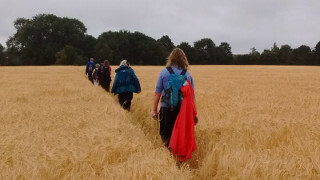 Walking through a wet wheat field. Beginning at the village Triangle, we set out on footpaths leading to Knapp Wood dominated by pines, oak, maples and giving a brief respite from the showers. There followed a stretch of country road walking before entering a field, meadow and Berry Copse with its variety of trees including conifers and cypresses. This led to the railway arch and the locked gate. However thanks to Chris we discovered it not necessary as expected to climb over, as the heavy chain and lock could be manoeuvred over the pole - not obvious on the pre-walk! 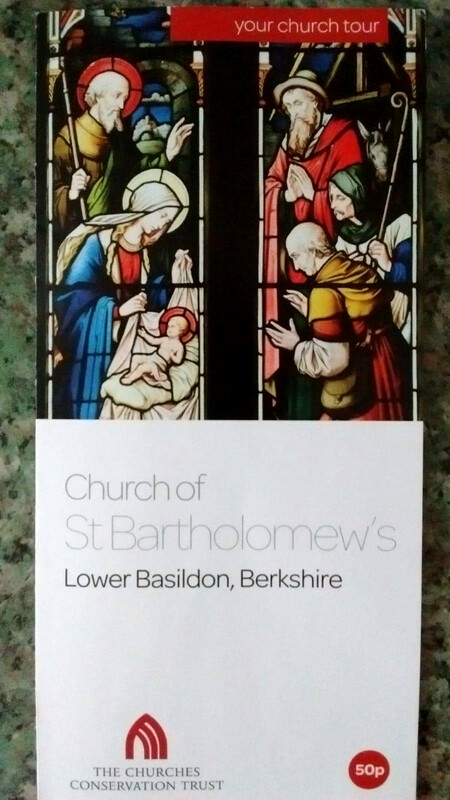 Church Notice at St Bartholomews Church. Crossing the main road to the river Thames we turned left to follow the towpath, taking in the sailing boats, moored barges and variety of wildlife. Passing by Beale Wildlife Park the path continued along the river for some time before leaving to head along a path into a meadow and finishing at St Bartholomew’s church in Lower Basildon. 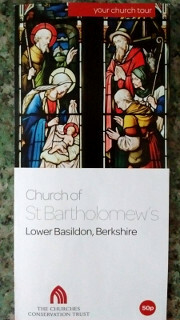 Built in the 1200’s is now a protected building run by the Churches Conservation Trust and makes visitors welcome. Indeed the local volunteer allowed us to sit comfortably inside for lunch and gave us snippets of local history and celebrity appearances. History reveals the resting place of Jethro Tull 1674-1741 of the Agricultural Revolution. Sir Francis Sykes and Major James Morrison of Basildon Park. Plus a monument to the tragic accident of the Deverell brothers from the village. After hearing the chime from the newly restored clock tower we headed off down the road, over the railway bridge to the main road. Turning right past rows of mock Tudor houses we then took a lamp lined driveway into the Hillfield Estate. At the top this forked off onto a bridleway and field edges leading to Harley House and an intriguing antique filling pump - necessitating a group photo! Mysterious pump at Basildon Park. Coming out onto a lane we reached Godwin’s Lodge an interesting 2 bed flint home opposite Basildon Park. For sale, Colin in the group quickly found at a price of £650,000 prompting a discussion on Lottery wins! Taking the Basildon lane and bridleway we followed the walls of Basildon Park - restored by Baron & Lady Lliffe then bequested to the National Trust, a splendid property and grounds which can be visited. We left the lane entering a trail besides pastures and beech glade, emerging onto a drive then taking a footpath nearby across resplendent wheat fields. From here into woodland and track leading directly back to the triangle. There was an optional pub stop at the end but, we agreed to return home to get dry, whilst one couple went on to visit Basildon Park. 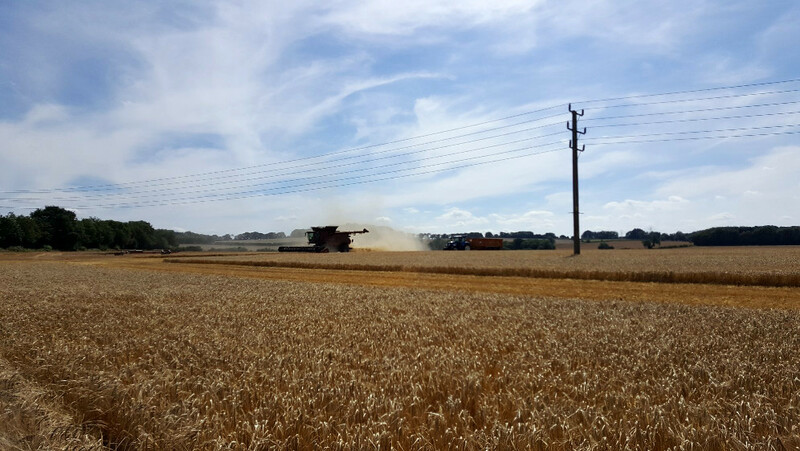 A combined harvester working its way through a wheat field. I think I'm not alone in finding it difficult to enjoy long walks in particularly hot weather. 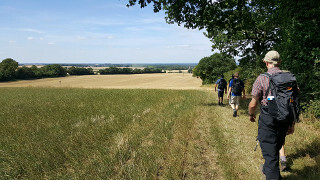 On Saturday 4th August, the forecast was for temperatures to reach 28°C in the afternoon, but our walk had a figure-of-eight route, meaning I could do the first half of the walk and leave before it got too hot. 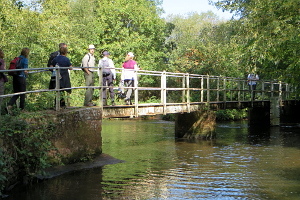 Eight of us turned up for this 10½ mile walk in Crondall in Hampshire, which was a reasonable number for a Saturday, considering the predicted temperature and that we were a bit outside our usual Berkshire area. Parched ground, cracking in the heat. We set off along Croft Lane, past the imposing Grade 1 listed All Saints Church, and out of the village heading south-west. Leaving the road as it became a farm track, we took a footpath along the edge of a recently harvested wheat field, now just stubble and cracked dry soil. The footpath took us into Lee Wood, which gave us a bit of shelter from the sun. Emerging from the wood, the path took us past some expensive looking houses to a junction of two lanes. We stopped just before the path ended to take a drink from our water bottles. Then we followed one of the lanes. We followed the lane past Montgomery's Farm and at Travers Farm we left it for a footpath through Thorn's Farm. Here we saw a couple of deer running across a field. I wasn't quick enough with my camera. Joining a track, which became a lane and then a road, we made our way back to Crondall. Stopping in the grounds of the Village Hall, we ate our packed lunches while watching people setting up what looked like a summer fete. We left before it got going and went to the Plume of Feathers pub for a drink. After we finished our drinks, two of us said goodbye and went home, while the rest of the group began part two of the walk. Heading home. You can just see Crondall church in the distance. This involved heading east out of Crondall and through Oak Park Golf Course to Dora's Green. Turning round, the route continued through Clare Park Farm and up to Wimble Hill. 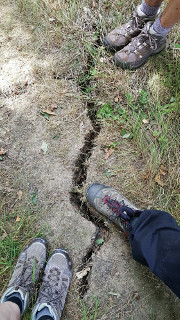 I'm told the views were good but in some places the parched ground had cracks in it almost wide enough to swallow a walking boot! The last part of the walk was on footpaths through farmland, heading north back to Crondall. All Saints Church, the highest point in the village, could often be seen on this last leg of the route. See the complete route on Google Maps. Thanks to Mark B for leading the walk, Denise for providing the photos and Rob H for recording the route on his GPS. On the Three Castles Path through Warren Heath. On Saturday 18th August, Julie B led her first walk for the BWWs. 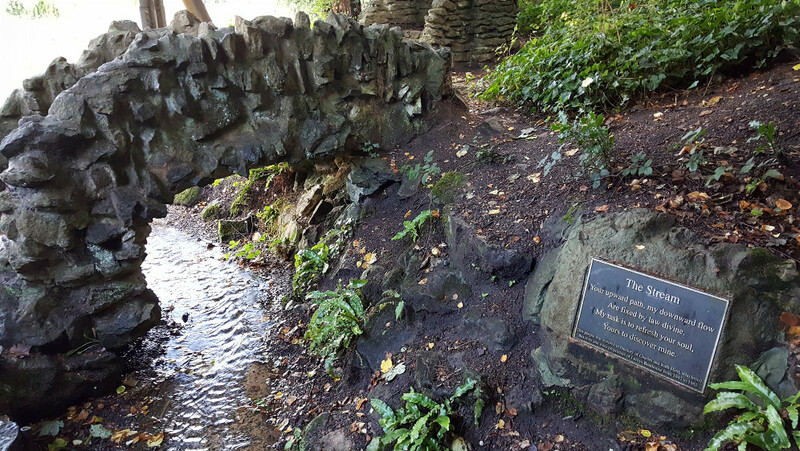 Julie and Mark have led walks together in the past but this walk was all hers. Fifteen of us met up at the car park by St Mary's Church, Eversley. A good mix of BWW regulars, newcomers and guests from other groups such as the Berkshire Walkers 20s & 30s and a group from Staines. We started by following the Three Castles Path through Warren Heath. 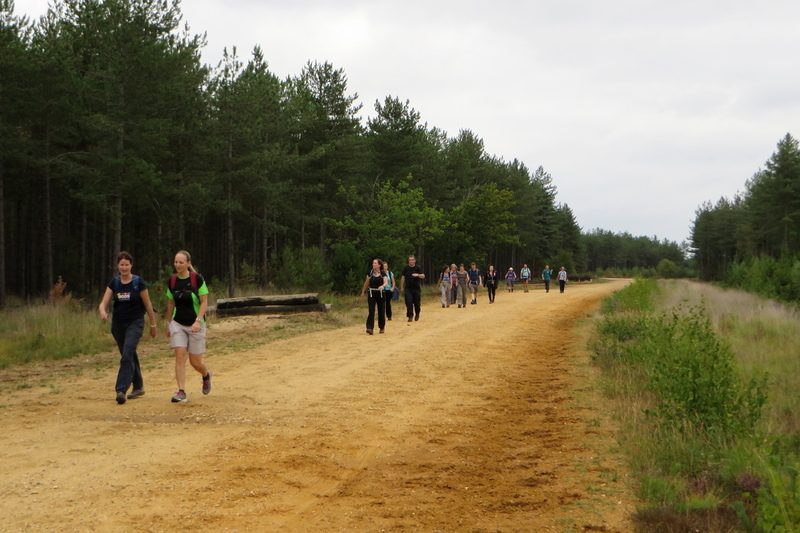 The footpath went through mixed woodland and then it became a wide track through a pine plantation. There were some low jumps at regular intervals alongside the track, but the only horses we saw were being ridden gently along the main track. 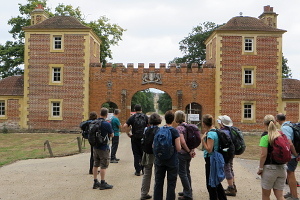 Double Lodge, gateway to Bramshill House. Leaving the Three Castles Path near Hatts Cottage, we passed through an archway in a tall hedge and past a large pond. This was private ground so we stuck to the footpath as it continued north-westward through Hazeley Heath. 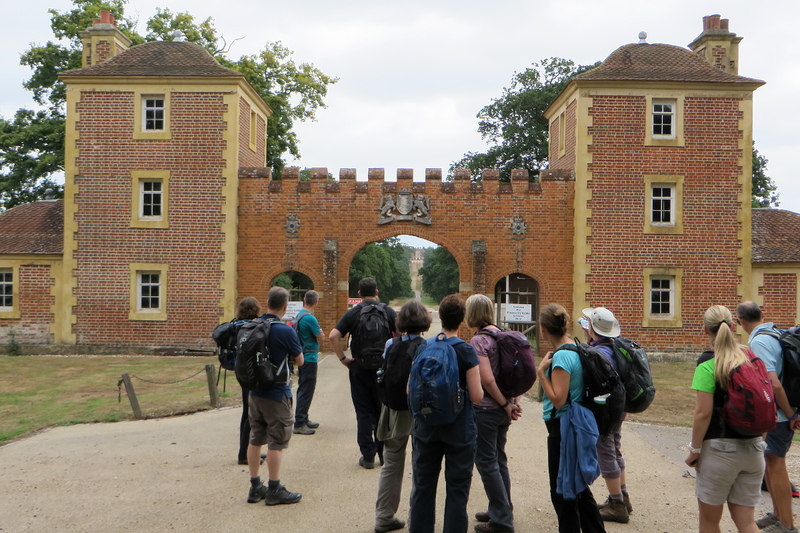 We stopped in front of an imposing gateway to Bramshill House, which has quite an interesting history. This Jacobian mansion, built in the early 17th century has changed hands many times over the years, but most recently it has been home to the Police Staff College. It is said to be haunted by a bride who accidentally locked herself in a chest on her wedding night and was not found until 50 years later. We stopped for lunch in a silver birch wood, where we found a few fallen trees to sit on. After lunch we left the woodland for the Shoulder of Mutton pub in Hazeley. Suitably refreshed, we made our return journey through farmland and then woodland at Heath Warren Wood. Here we strayed into the territory of Gunman Airsoft where an organised skirmish was taking place. A whistle was blown and proceedings came to a halt while we made our way back to civilisation, taking their advice not to stray from the path. Leaving Heath Warren Wood, we passed through some farmland before emerging behind the St Mary's Church, from where we had started. See our route on Google Maps. Swans being photographed in Swan Lake Park. 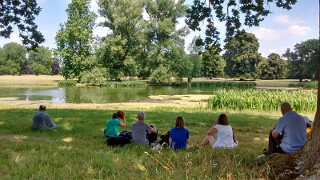 On Bank Holiday Monday, 27th August, a surprisingly large turnout of 25 people from various Ramblers groups met at Sandhurst Memorial Park for this walk of about 7 miles. We began by leaving the park and joining the Blackwater Valley Path eastwards. A bridge took us over the Reading to Guildford railway line and we soon arrived at Swan Lake Park. 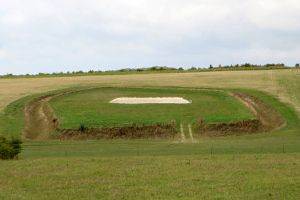 This is a former gravel pit now transformed into a recreational area as part of a housing development to the south of the site. We followed the path between the river and lakes and cut through a new retirement village, where there was still construction in progress, to the road. 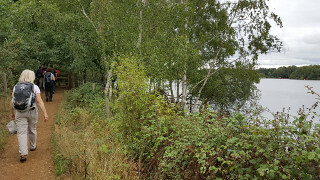 A short section along the pavement led to a footpath next to Trilakes Country Park then another road section to Horseshoe Lake (another former gravel pit now used for watersports and a location featuring quite often on BWW walks). 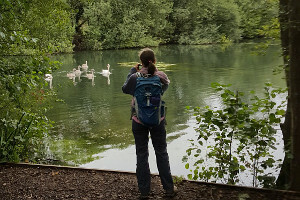 Here, instead of walking past the watersports centre we continued along the Blackwater Valley Path to a path which runs between Grove and Horseshoe lakes then along the north side of Horseshoe Lake. After leaving the lake we crossed a field with horses and then followed a path through woods to our lunch stop at Ambarrow Court. This was chosen as a wooden bench and picnic table were available but due to the size of the group the majority ended up sitting on the ground! 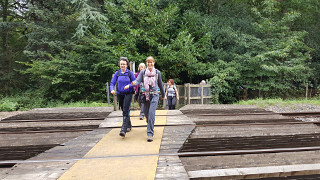 The next part of the walk started by crossing back over the railway line, this time via a level crossing. We walked through Edgebarrow Woods past the grounds of Wellington College, to Wildmoor Heath. Here we had to walk around some puddles from the heavy rain the previous day - quite a novel experience after the long spell of dry and hot weather! The path included a boardwalk across a usually marshy area which makes an excellent habitat for dragonflies, but unfortunately there had not been enough rain yet and the area was almost dry. After the boardwalk we arrived back in Sandhurst and it was then just a short walk along some quiet roads before we arrived back at the park where we had started. See our route on Google Maps. Thanks to Denise for leading this walk, for writing it up and providing the photos. 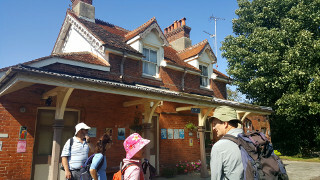 The old Compton railway station. On Sunday 2nd September, nine of us met up at a car park near Streatley for this walk of about 10 miles. 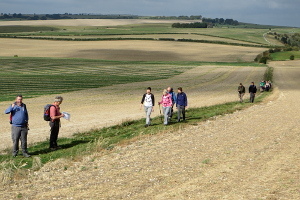 The walk began with a section of the Ridgeway, with good views across the countryside. The weather was warm and sunny but there were early signs of autumn with many trees and shrubs covered in berries. Next, we descended into the village of Compton, stopping to look at an old station building, now converted into a house but with the side which would have faced the platform left in almost its original state. We also passed the church but didn't go inside as people were just leaving after the Sunday service. 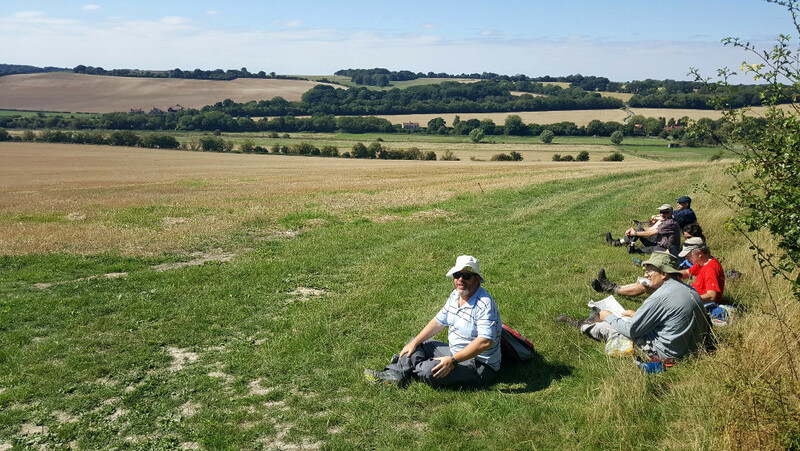 Stopping for lunch on The Ridgeway. Another short climb took us to a hillside where we sat and enjoyed the views whilst eating our lunch. 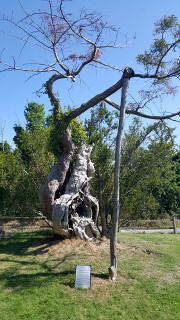 Ancient Yew tree in Aldworth Churchyard. There was then some road walking and another footpath before we arrived at Aldworth and the 14th century village church. This time we did go inside, as the church contains some unusual monuments. These are stone figures of the De La Beche family who lived nearby in the 1300s. They all over 7ft tall and said to be life-size! The churchyard also has another point of interest - a yew tree which has been dated as at least 1000 years old. It’s a shame trees can’t talk as it would have been able to tell us whether the family really were as tall as their statues! After all this history it was time for refreshment at the nearby Bell Inn. On leaving the pub it was just another couple of miles of paths across fields before we were back at the car park. See our route on Google Maps. Thanks go to Keith for leading this walk, to Denise for writing it up and providing the photos, and to Rob H for the GPS recording. The Wayfarers Walk between White Hill and North Oakley. 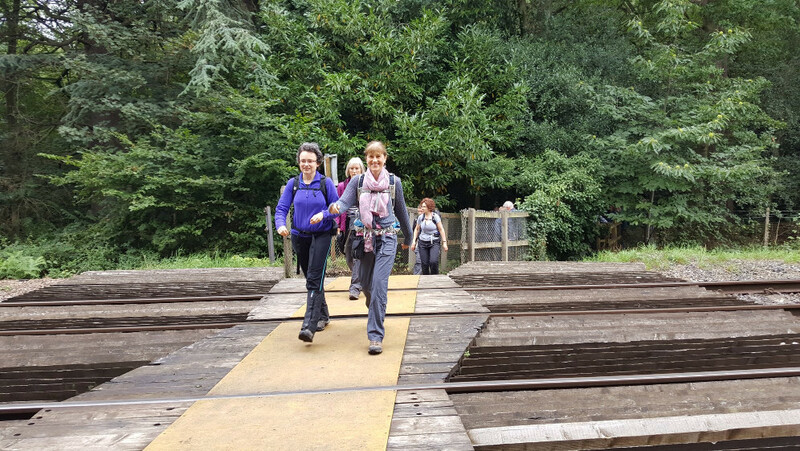 We joined forces with the Pang Valley Ramblers on Sunday 9th September for a 6½ mile walk led by PVR members Pauline and Alistair. There were twenty-one of us in total, mostly PVRs but there were seven of our group, one from the BW 20s & 30s group and one from the Chiltern Weekend Walkers. 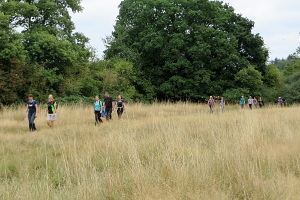 Setting off from the White Hill car park, we followed the Wayfarers Walk heading south-eastwards across the fields of Freemantle Park Farm. Crossing a quiet lane, we continued on the Wayfarers Walk as it passed through Walkeridge Farm and a small caravan site, down to Tidgrove Warren Farm. Here we stopped to look at the recently excavated footings of the King's House at Tidgrove. 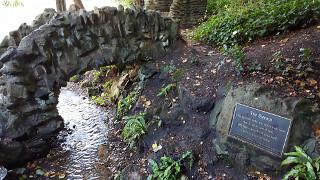 The site of the King's House at Tidgrove. Believed to be the site of a 12th century house, used as a stop-off point for Henry II when journeying between Southampton and Windsor, this was discovered by observing 'crop marks' in aerial photography. All that is visible now is some chalk footings and a surrounding ditch. We left the Wayfarers Walk as it passed through the hamlet of North Oakley, diverting across The Manor Farm and into the picturesque village of Hannington. Here we passed The Vine pub without stopping for a drink! Don't panic! This walk didn't include a pub-stop or lunch-stop en-route as a pub lunch was planned for the end of the walk. Crossing through The Manor Farm, North Oakley. Leaving Hannington, we headed north through farmland and then west, through a thin strip of woodland to Cottington's Hill. 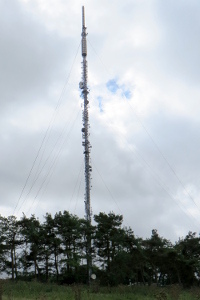 Here stands a mighty transmitter mast, providing TV and radio (and other services) to North Hampshire and Berkshire since 1970. 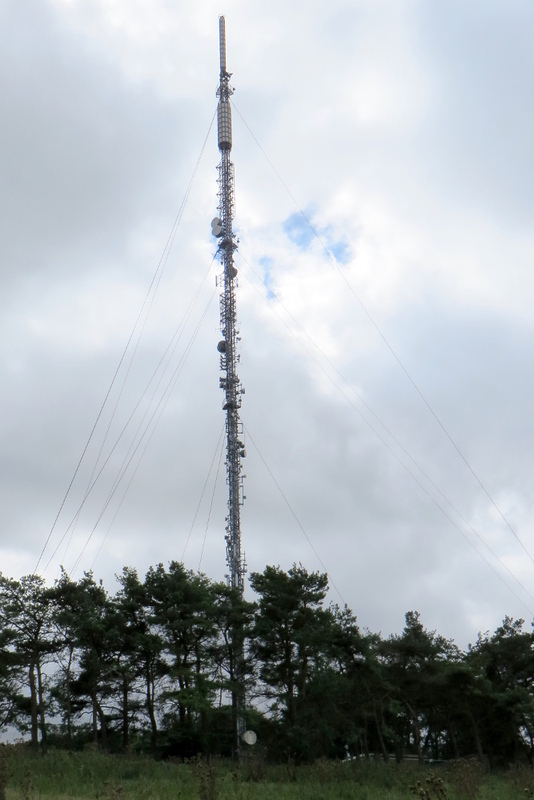 The walk leaders persuaded me (without too much trouble) to tell the story I know about this transmitting station. The Hannington television transmitting mast. Around 5pm one Saturday in November 1977, the sound channel for ITV was hi-jacked and a strange alien voice was heard, claiming to be from an extra-terrestrial being called Vrillon of the Ashtar Galactic Command. The six-minute message warned us of the terrible damage we were doing to our planet. The vision channel continued to show the ITN early evening news but without the news reader's voice. The ITV telephone switch-board was jammed with calls from worried viewers and the incident was reported in the Sunday papers. It's believed to have been a hoax but the perpetrators were never found! 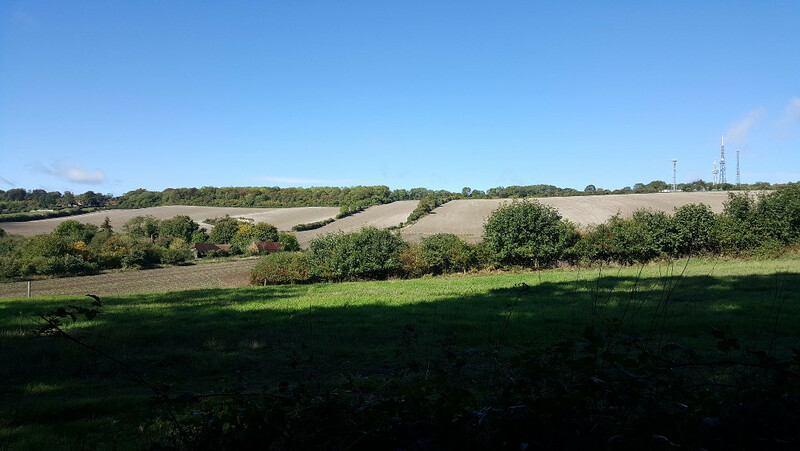 The last part of the walk involved a steep path straight up Cottington's Hill and then a more gentle down hill route through farmland back to the car park at White Hill. See our route on Google Maps. After this enjoyable walk, the group divided into those who were staying for the pub lunch in Kingsclere and those going straight home. Thanks to Pauline and Alistair for leading the walk and for inviting our group to join them. 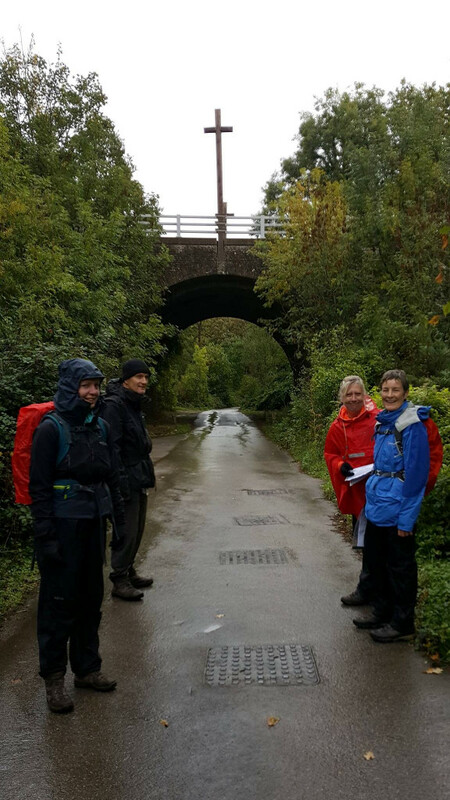 The weather forecast of rain for a good part of the ‘walking day’ did not deter Keith, Denise and new walker to the group, Julie, who joined Kathy and Ann for a 10½ mile walk from Shalford church in Guildford. A few hardy souls on The Pilgrim's Way. The rain was heavy at the start and I (Ann) set off at a quick pace, apparently it was the fastest I had been known to walk! I guess I did not want to hang around in the rain........ We made our way to the River Wey, going north from the church, before taking a path through some wooden gates to the river. Crossing a wooden bridge we headed to St Catherine’s Lock and on into Arlington village, passing the very impressive sports facilities of the Surrey Police HQ. We passed Loseley Park where there was a ‘dog agility’ event taking place in the grounds. Loseley House is part made of stone from Waverley Abbey, with interior wood panelling thought to come from Henry VIII’s defunct Nonsuch Palace. The rain had almost stopped by this point making the walk much more enjoyable. Heading to Little Polsted and passing Polsted Manor, we continued to the village of Compton, passing both Eastbury and Westbury Manor. After some field walking we crossed the A3, heading for Puttenham were we skirted a golf course before reaching a cricket pitch where we stopped for lunch. There was a small amount of rain at this point and we were lucky to be able to sit on a bench under the trees. In the same vicinity is Frowsbury hill, a bronze-age burial site where Queen Victoria and Prince Albert viewed the mounted troops in 1858. 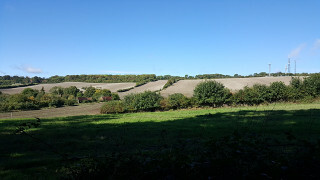 The North Downs Way between Compton and Shalford. 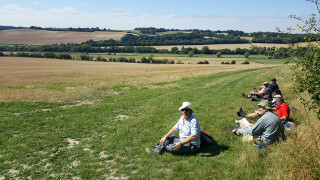 We picked up the North Downs Way (NDW), also part of the Pilgrim’s Way (a historic route used by pilgrims from Winchester to the shrine of Thomas Becket at Canterbury). We followed a footpath entering woods of mainly red oaks, passing a nature reserve belonging to Loseley Park. The track/tarmac drive took us under the A3 to an arch below the slip road where there were large wooden crosses marking the Pilgrims way running underneath. Reaching the outskirts of Compton we took a diversion to the Watts Gallery (George Frederick Watts; a Victorian painter of symbolic works) which also had a shop and café. The Spewing Stream near Shalford. Leaving the gallery, we headed through West Warren, which is dominated by oak and beech trees, and into the woods of East Warren, leaving the NDW for a short time. After Piccards Farm we re-joined the NDW. We descended onto the Portsmouth Road in St Catherine’s, with the ‘Ye Old Ship Inn’ (dating from the time of the pilgrims in 1556). Leaving the main road we headed back to the River Wey, where there is a ‘spewing stream’ going under a tiny rock bridge, with a seat on the other side. 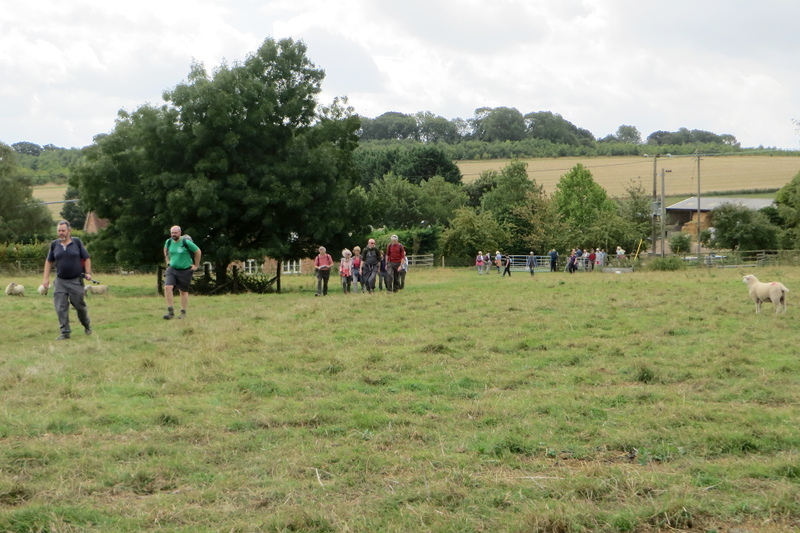 After crossing the footbridge we made our way back through the playing field and back to the church in Shalford. Thanks to Ann and Kathy for leading the walk, for wrtiting it up and for providing the photos. The Green outside St James Church, Finchampstead. 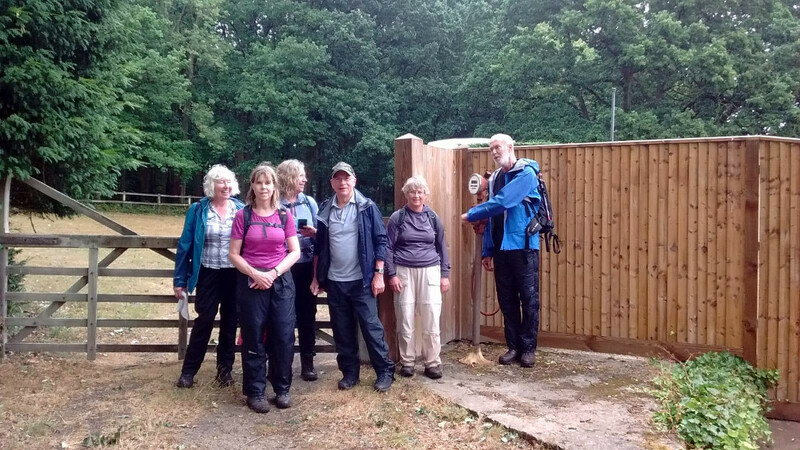 On Saturday 29th September, nine of us (including four visitors from other groups) met up at the Rook's Nest Wood Country Park car park on Barkham Ride. Not a bad number for a Saturday, as it seems that Sunday is a more popular day with our group. Setting off from the car park, we followed Barkham Ride for a short distance before taking a footpath that led us to California Country Park. We skirted the north and west shore of Longmoor Lake. While a few of us took the opportunity to use the toilet facilities, our leader Jim explained some of the history of the park. It has been a zoo, a munitions factory during World War II, then an amusement park with various rides and a ballroom. The ford over the Long River at New Mill. Leaving the park, we followed roads and footpaths to Finchapstead, well the bit of it with the Queen's Oak and St James Church, which seems to be separate to the main part of the village. Then it was hedge-lined footpaths to Eversley, well the bit of it with the Talley Ho pub, which is separate from Eversley Centre and Eversley Cross. All a bit misleading really. From there, we followed the Long River through various fields, stopping for our picnic lunch when we found a large log to sit on. Next we took a footbridge over the Long River by a ford. We even saw the ford in action as a Range Rover waded through it. The water was two feet deep. I wouldn't have tried it with my car! 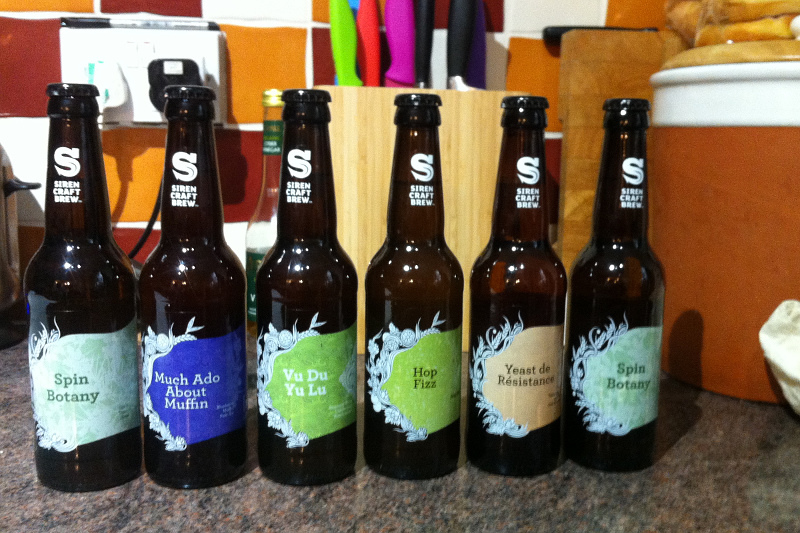 Jim's haul from the brewery. A mixture of fields, footpaths and roads brought us to the Hogwood Industrial Estate. Not exactly a rural idyll but Jim had a reason to bring us here. Deep into the estate we found Siren Craft Brew, a brewery with a recent award for the "Champion Beer of Britain". There was a bar inside the business unit and tables outside. Of course we stopped to try their produce. Refreshed, we headed back to California Country Park and took a route around the east side of the lake before retracing our steps back to the Rook's Nest Wood Country Park car park. See our route on Google Maps. Needless to say, Jim and Emily stopped by the Brewery on their way home to stock up. Thanks to Jim and Emily for leading the walk and Rob H for recording the route on his GPS.